A guide to children's ministry that serves families with special needs. Jesus set a high standard when He said "Let the little children come to me and do not hinder them, for to such belongs the kingdom of heaven." The call is not limited to children who will sit quietly at His feet and listen, who color between the lines, who raise their hands and wait to be called upon, and who work at grade level. Children's ministries are responsible to be ready to bring children with disabilities to Jesus' feet too. 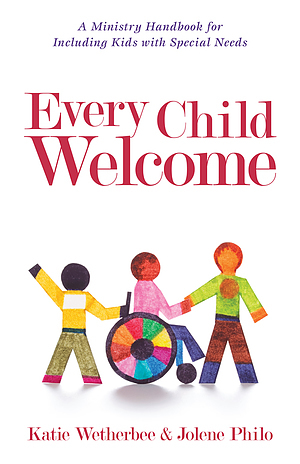 Every Child Welcome is the guide for leaders and volunteers to assist in purposeful planning and skill development for a ministry inclusive of children with unique needs. Every Child Welcome by Katie Wetherbee; Jolene Philo was published by Kregel Publications,U.S. in July 2015 and is our 40114th best seller. The ISBN for Every Child Welcome is 9780825443503. Be the first to review Every Child Welcome! Got a question? No problem! Just click here to ask us about Every Child Welcome.